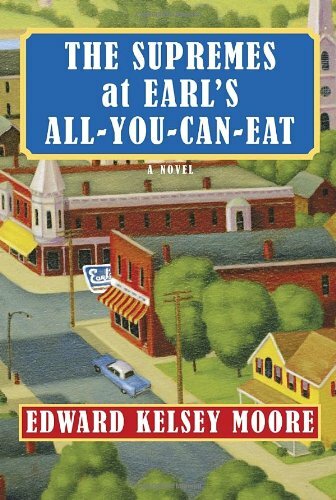 The Supremes at Earl’s All-You-Can-Eat encapsulates the lives of three close friends—Odette Henry, Clarice Jordan Baker, and Barbara Jean Maxberry—who come of age in the 1960s but live their lives in the southern Indiana town of Plainview in the neighborhood of Leaning Tree. Odette has the distinction of having been born in a sycamore tree and as a result is raised (and expected) to be fearless, outspoken, and sensible, traits that come naturally but make it difficult for her to admit fear and uncertainty when she faces her greatest challenge in life. She may be no beauty by society’s standards, but she cannot be ignored. Clarice is a musical prodigy whose claim to fame is being the first black baby born in University Hospital. She was also born carrying the great expectations of her mother, but both women sacrificed themselves for the sake of their man. Finally, Barbara Jean is the daughter of a stripper who drank herself to death while searching for a sugar daddy to keep her and her daughter. Barbara Jean is the most beautiful woman in the area as well as one of the richest, despite her background and struggles to keep from turning into the woman her mother tried to be and wanted her daughter to be. These friends come together at Earl’s All-You-Can-Eat diner. Big Earl McIntyre’s diner is the first black-owned business in downtown Plainview, which is quite an achievement in the 1950s. He becomes a surrogate father and counselor to the girls as well as to the entire community. He is the one who designates the best window table in his diner as their domain when they are teenagers, and the friends continue to hold court there. His diner helps keep the community together even as a newer generation starts to overshadow those who came before. The girls are now middle aged, but they and their husbands meet every Sunday after church at Earl’s. The diner is a touchstone for their lives, and the book starts with an eerie premonition involving Earl and the diner that sets in motion a whole series of events that will uncover dark secrets and tragedies of not only the “Supremes,” but their family and friends. The world knows The Supremes to be Diana Ross, Mary Wilson, and Florence Ballard, three friends from the same neighborhood who rose to stardom. They would experience tragedy and scandal, but in the end, they remained legendary with a devoted following. The Plainview Supremes are quite similar. They have their devoted followers and their own experience of celebrity, and as the decades pass, will share each others’ sorrows and triumphs. The friends survive on the strengths and weaknesses of each other. They love each other deeply, but this does not prevent arguments or stop years of tongue biting to spare hurt feelings. So what first attracts attention to this book is the title. Seeing The Supremes at Earl’s All-You-Can-Eat on a list of other titles, one may wonder if it is about a little-known performance done before The Supremes became mega stars, or maybe it’s a fictional story involving the actual singers similar to the Eleanor Roosevelt mystery series penned by her son Elliott. It would be wrong to assume. The real Supremes do not appear in the novel (although Mrs. Roosevelt does). Author Edward Kelsey Moore has created an attention grabbing title that compels further investigation. A person can read the story and wonder which friend best personifies Diana, Mary, or Flo, but that would be at the expense of missing out on the emotional story beneath. Using the word “emotional” in relation to a book of women’s fiction immediately connotes weepy melodrama. Men—and women—have been guilty of writing romanticized, overly sentimental pap for women audiences that left many of us disgusted, insulted, and forced to inject insulin to counterbalance the literary treacle. The Supremes does not fall into this trap. In The Supremes literary liberties are taken that might leave conventional genre purists cold. The story is told, in part, from the intimate point of view of Odette while Clarice and Barbara Jean’s viewpoint is told from a more distant narrative. This reasoning becomes clear as the story progresses. Having the ability to move between multiple viewpoints in this fashion, apart from its flexibility, allows showcasing of the special relationship Odette has with her mother in a creative, humorous way. Mr. Moore weaves a tale that seems loose at first, but slowly tightens until it is clear that the plot and characters are much more entangled than at first glance. Intriguing clues are dropped along the way to keep the reader motivated to continue when it seems as if the story is veering too far off on a tangent. Some action that may have been insignificant to one ends up having a great impact on another. The story takes place in both the past and the present, showing the girls coming of age in the 60s, marrying and having children in the 70s, and now grandmothers in the 21st century. They have seen their small town and their lives change and progress from the violence and uncertainty of the Civil Rights Era to the present day where some things may have changed, but in the lives of our characters, some things remain the same, for better or for worse. Mr. Moore deftly handles the topic of race and race relations; two issues that will undoubtedly arise in any novel spanning the Civil Rights Era. While racial issues do not dominate the storyline, they definitely have a significant impact, which Moore presents in a plausible and poignant way that doesn’t overdramatize nor dismiss the harmful effects of racial prejudice. But The Supremes is not a depressing book; in fact, it is quite uplifting. There are several laugh out loud moments that anyone with experience living in a small town can appreciate, especially when comparisons among the three different Baptists churches are made—and each Supreme belongs to a different church. Don’t let the fact that The Supremes is written by a man discourage you from giving this novel a try. Nothing is more distasteful than a man trying to write from a woman’s point of view and failing miserably. Fortunately, Edward Kelsey Moore knows how to write a terrific, complex, believable, and always intriguing story. He has portrayed his female characters in such a way that even when they are being obnoxious you must read on if only to find out what happens to them next. Zetta Brown is an author and the editor in chief at LL-Publications. Originally from Texas, she now lives in Scotland.